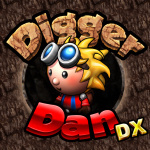 Digger Dan DX Dispute Settled, Will Be Back On Sale "As Soon As Possible"
"We have already settled this issue to our mutual satisfaction"
At the weekend we reported on the news that the likeable title Digger Dan DX had been removed from the 3DS eShop due to a takedown notice from First Star Software, the company which owns the rights to the thematically similar Boulder Dash. Fingers crossed Digger Dan can tunnel his way back to the eShop sooner rather than later. I would like to take this opportunity to thank everyone who commented on the story about the removal of Digger Dan DX from the eShop. Especially those who encouraged me to contact First Star Software. My pessimistic nature led me to incorrectly conclude that the only way to restore the game to the eShop would be through legal action. A few months to reinstate a game? Why? Should take a day! Wouldn't mind knowing Roughly how you got this sorted what was the remedy, i picked this up on launch day a Rare thing for me how could i not at that silly price and a pretty good enjoyable game TBF. I can hardly wait to purchase this game after reading about the current situation with this software. @BornInNorway81 It is tested again fully by Nintendo as if it is a new product. Plus there is a waiting list for the test department. I'll try to get it back as soon as possible, I promise. Great news. I have already bought the game and like it. @ImDiggerDan I'm so glad to hear this was resolved! Please let us know once it's back up in the eShop, if you can, and keep us posted on future projects as well. Great news! It's a wonderful game and I'm glad you will be able to continue to sell it for others to enjoy. @ImDiggerDan I'm glad your problem was settled, it was completely unfair. To be honest, I didn't get into your game because of taste, but it's good quality, especially for the price, and it's quite different from Boulder Dash. @ImDiggerDan Reading your comments in the other story's comments and in this one, it seems like you've been pretty level -headed about the whole thing. I'm glad this worked out for you, I'll pick up the game once it's back. @ImDiggerDan I'm happy for your resolution. It certainly appeared that the action taken against your game was uncalled for. Hopefully, the news will give you a bump in sales once the game returns to the eshop. @ImDiggerDan Congrats! Are you at liberty to share what exactly the problem was, and the terms you negotiated with First Star Software Inc.? Great game and cool developer, they both deserve another chance and all the success coming to them. @C-Olimar Oh, I'm sure it will. Streisand effect, gotta love it. Sure am glad this was resolved without turning into a nasty legal dispute. Diplomacy and fairness wins for a change! Yay! Glad to see it will be back up soon. @ImDiggerDan That's great to hear. I'm glad it worked out in the end. @ImDiggerDan Glad to see you got a quick resolution. Will pick up a copy of your game once it is back on the eshop in support. Glad to see that your game gets to rightfully return to the Eshop! @ImDiggerDan Fantastic news, congratulations. Glad the company saw sense and you were able to resolve it amicably. I don't own a 3DS (yet) but if you ever bring the game to WiiU I'll definitely pick up a copy, looks right up my alley. @HandheldGuru97 Well, technically it should be possible to get it back a little faster than I have in mind, it's just that I'm considering adding a few more levels. $2/£1.80 is a bit steep for only 100 levels. No promises, though. Level design is tough! @ImDiggerDan So is it changing up anything about the original game? I presume when you add more levels there'll be an update ? Anyway I'm really happy you got your game back, I made a YouTube video about your situation so I'm really happy now I can make another one sharing the good news! @DoctorOverbuild The original game will remain unchanged. An update is required to restore the game to the eShop, so it made sense to chuck the extra levels (if I can design them!) in at the same time. Existing owners will be able to update, new owners will automatically get the latest version. @ImDiggerDan Congratulations ! I love your game and I'm happy it will be enjoyed by many more players around the world ! @ImDiggerDan This is good news, but I sincerely hope the "terms" don't include you paying any portion of your game's income to the other developer, because that would be a colossal travesty. @ImDiggerDan Awesome! I'll be sure to mention that in the video I make then! So happy for you! Awesome news! One of my friends read about the takedown and told me about it (although I'd already read about it here on NL) because I won't stop telling him to download it. (But he has the original, so that's one sale, I guess). @ImDiggerDan While I personally think the going price is MORE than fair, new levels are always welcomed! Didn't know you were working on something like that. Obviously the game is a nice package on its own, but that's a pretty exciting bonus! I'll be getting this when it relaunches. Congrats on being able to continue to sell your product. I wonder what the exact issue was. The articles, to me, just showed an opinion that it was because the titles are similar in design. Well, good. This whole situation seemed silly to me. So, what exactly did you have to change/do in order to get it back on the store? If you're allowed to say. I expect probably not, because I know what theses companies are like: They like to try to abuse you intitally, and then when some "agreement" is reached they don't want you to tell anyone about the douche politics that went on because people might see them for the tools that they are. But maybe I'm just coming at this from my own pessimistic perspective based on personal experience. @ImDiggerDan: Glad to hear that everything went well! I'm looking forward to the eshop re-release! Extra levels are always a plus, though from what I gather above, your price is already generous. I still think it was ridiculous that they had the game pulled. Why couldn't they have contacted you first instead? I hope they don't get any money from this. I still think they are scumbags. Good for you for getting it back up, it was a travesty that it ever got taken down. I do think perhaps the extra publicity was a blessing in disguise. I know this stuff is usually hush hush but, what happened? Feel free to say it's none of my business! Brilliant! So pleased for you. Already got my copy, though no time to play it yet. I'd better get on with it to take advantage of the upgrade when it's back in the eShop. Such great news. Was rooting for you. Definitely picking the game up when it gets back on the eShop! Managed to pick this up before it was pulled the other day. Glad to hear the dispute has been settled and it'll be back up soon. I'm really happy for you! I create comic books (in fact I'm working on a comic book about a mobile game a friend of mine created) so I know you've put a ton of hours into creating the game. I'm definitely going to download the game once it's available again! Hah, good news, glad this all got sorted, looking forward to seeing what you add to this game, I'm enjoying it! I am very happy for the developer! @ImDiggerDan Honestly from just looking at the pictures I've seen it would not seem the type of game I'd be interested in. However this emotional roller coaster of losing all you worked on, not having funds to start a new project and then the redemptive finale has moved me. It's been a hell of a ride and I look forward to buying this on probably all 3 of my Nintendo 3DS (My wife, my son and I) as soon as it's back up and running. Here's a quick update: Technically, I could send off a resubmission to Nintendo of Europe now. Need some feedback before I can submit to America. However, I do want to add these extra levels, so they are going to take some time to create. I will aim to get these done before my holiday in 2 weeks time. @ImDiggerDan I'm glad you were able to resolve the issue to your satisfaction. I was a huge Boulder Dash fan from as far back as the Commodore 64 version, and I think there are only minor similarities between your title and the Boulder Dash series. 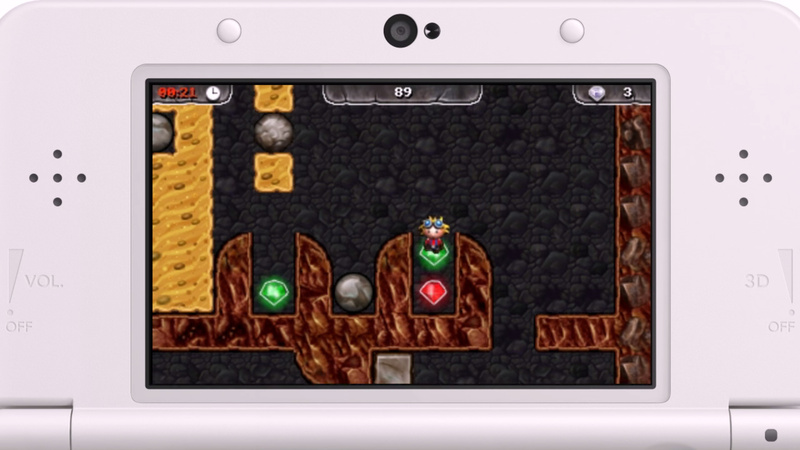 You both have rocks, gems, and dirt... but having played the Boulder Dash XL 3DS game, I'd prefer your title over that one. What irked me a lot about your resolution is that you had to claim that this game is published with "permission" from First Star Software, as stated on the boot up screen. I know this is a simple and quick resolution, but it just bothers me that they had the gall to bully you about it, especially considering they really don't push the limits of their aged Boulder Dash IP. I suppose they felt threatened because, in my opinion, you have the superior product. The way I look at it is as if one of the major platform games like Mario (Nintendo) or Sonic (Sega) caused a cease and desist for all future platform games just because the character can run, jump, and stomp enemies. It made me lose respect for First Star Software. Anyway, I hope you continue to build on Digger Dan as a series. I think there's plenty of room for you to grow with this title. @Deadstanley Thanks for your support. In the end, what is important to me is that the game is available for people to play, and that they enjoy it. As for future projects - I'm really not sure what is next. I have a day job a family and a house that needs cleaning and redecorating from top to bottom! I don't have a lot of free time.